Nordic Walking Poles when sized correctly and when using the proper technique can radically improve balance and stability. Perfect length poles help us to automatically walk with a super straight back – better walking posture is biomechanically a good thing. This improved walking posture when combined with the unique 4-Wheel-Drive type action of walking with poles radically reduces the stress to the shins, knees, hips and back. Using the Perfect Length Poles is much more comfortable than using a cane, a walker and or pushing a shopping cart. 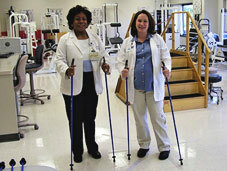 Nordic Walking Poles are also dependable enough for those transitioning from crutches, canes and/or walkers. For individuals with balance, stability and gait issues it is recommended to keep the poles straight up and down – perpendicular to the ground. Do NOT focus on the arm movement as much as on enjoying the added balance and stability provided by the poles. Remember to NOT squeeze the poles – take advantage of the comfortable patented straps and keep your finger relaxed (no white knuckling of the pole grips!). If someone you know has difficulty walking due to weight issues, balance, stability or gait, ask them if they feel most comfortable walking while pushing a shopping cart. If the shopping cart is a good thing, then they are prime candidates for one-piece Nordic Walking Poles sized correctly to their height – a huge improvement over canes and walkers, and much more versatile than a shopping cart. Seniors and individuals with disabilities and balance issues should avoid cheap/flimsy 2-piece and 3-piece collapsible walking poles. One-piece poles that are sized correctly are safer, lighter and much more durable than cheap/flimsy twist-lock and flip-lock 2-piece and 3-piece poles that tend to rattle, vibrate and/or collapse unexpectedly. Our one-piece SWIX and EXEL Nordic walking poles have been consistently receiving 100% positive satisfaction ratings.